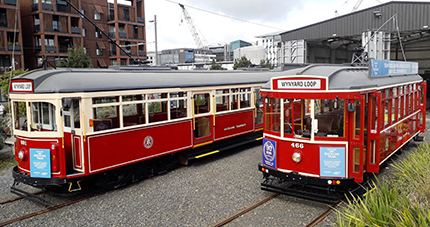 Welcome Aboard presents Auckland Dockline Tram, a centrally located travel experience and treasured piece of Auckland transport history. Where is the Auckland Tram situated? At the Wynyard Quarter. It loops around Halsey, Gaunt, Daldy and Jellicoe Streets between the Auckland Viaduct Basin and Westhaven Marina. Take advantage of your all day tramway ticket to get off and on at our four convenient stops to explore Auckland’s many vibrant attractions. Or stay on board in streetcar comfort for the whole 15 minute loop. Start by selecting your language and type the street name of your starting point. Our system will return suggested starting points based on your street name and you can use your mouse to select the street. If too many results are returned you can specify the town or suburb. For airports, simply type the name of the city followed by "airport".